Friends..the second set of SSC CGL Tier-1 Exam 2015 was held today (16 August 2015). 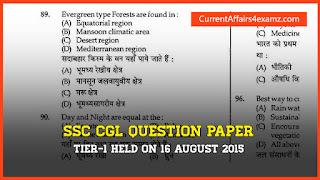 Last week we have shared with you the question paper and Answer Key of SSC CGL Tier-1 exam held on 9 August 2015 both morning shift and evening shift. We have received overwhelming support for that. Thank you for that guys. 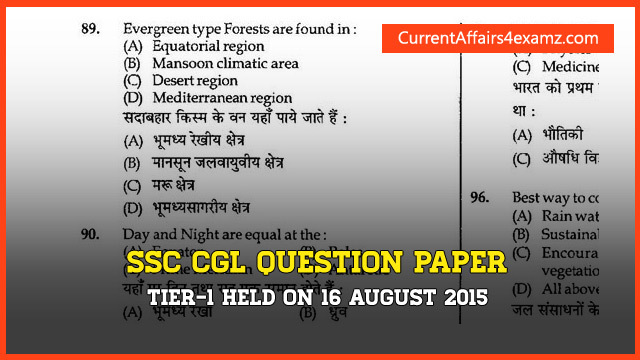 In this post, we share with you the question paper of SSC CGL Tier-1 Exam held on 16 August 2015. Today's (16.08.2015) morning shift exam had the code SS-2015 and Test Form Number starting with DM. You can download the question paper as PDF from the below link. Before coming to questions let's take a look at the analysis of this exam. Expected Good Score is between 120-125 and expected cut off is 100-110.